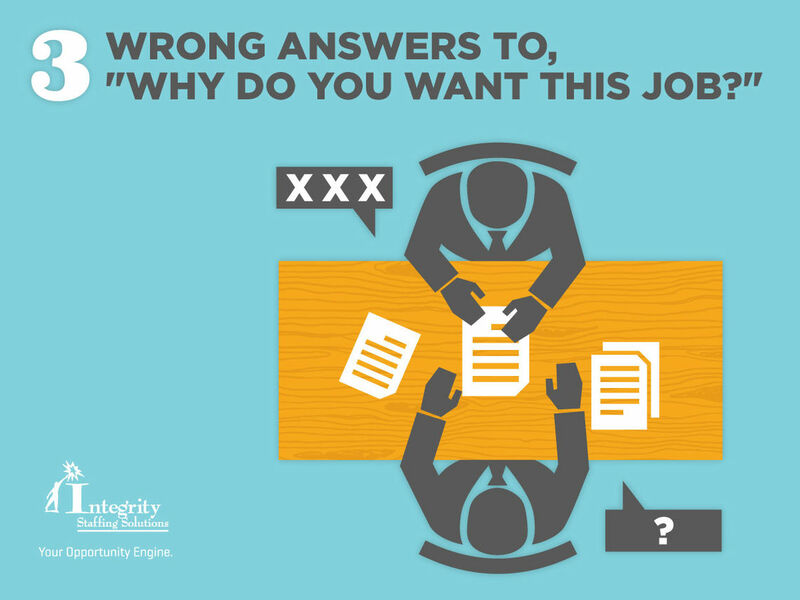 Integrity Staffing Solutions – 3 Wrong Answers to "Why Do You Want This Job?" Home>Blog>3 Wrong Answers to "Why Do You Want This Job?" 3 Wrong Answers to "Why Do You Want This Job?" At Integrity Staffing Solutions we interview tens of thousands of job applicants every year, and we're always surprised at how many people are thrown for a loop by this question. It's usually because they were unprepared for it, and as a result their answer didn't show them at their best. Here are the 3 most common mistakes we see. "Because I really need money" [wink wink]. "Because, um, yeah, this seems like a great place to work." It's not a good idea to memorize one answer and use it every place you apply. The hiring professional will recognize that it's just pre-programmed interview-speak, and will have learned nothing about your suitability for the job. Since you are researching the company beforehand anyway (we certainly hope), take a couple of minutes to figure out why this specific position and/or employer is perfect for you. OK, maybe not really 10 minutes, but do resist the tendency to babble on that happens to many of us when we're nervous. Don't list every little reason you'd like to work there, just the most important one or two. You especially don't need to mention factors that only benefit you, not the company, such as its location close to your home.